How to watch The Lord of the Rings: The Fellowship of the Ring (2001) on Netflix Australia! Sorry, The Lord of the Rings: The Fellowship of the Ring is not available on Australian Netflix, but you can unlock it right now in Australia and start watching! With a few simple steps you can change your Netflix region to a country like Canada and start watching Canadian Netflix, which includes The Lord of the Rings: The Fellowship of the Ring. We'll keep checking Netflix Australia for The Lord of the Rings: The Fellowship of the Ring, and this page will be updated with any changes. 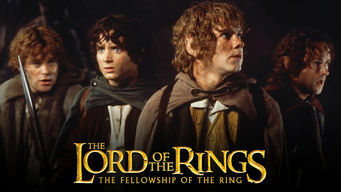 The Lord of the Rings: The Fellowship of the Ring is not available in Australia BUT it can be unlocked and viewed! From the idyllic shire of the Hobbits to the smoking chasms of Mordor, Frodo Baggins embarks on his epic quest to destroy the ring of Sauron. Middle-Earth's doom fits on a finger, and its hope lies with a tiny hero. Important things come in small packages. There is a way to watch The Lord of the Rings: The Fellowship of the Ring in Australia, even though it isn't currently available on Netflix locally. What you need is a system that lets you change your Netflix country. With a few simple steps you can be watching The Lord of the Rings: The Fellowship of the Ring and thousands of other titles! Watch "The Lord of the Rings: The Fellowship of the Ring"